Once on a time there was a poor, poor Widow, who had an only Son. She dragged on with the boy till he had been confirmed, and then she said she couldn’t feed him any longer, he must just go out and earn his own bread. So the lad wandered out into the world, and when he had walked a day or so, a strange man met him. “Whither away?” asked the man. “Oh, I’m going out into the world to try and get a place,” said the lad. “Will you come and serve me?” said the man. “Oh, yes; just as soon you as any one else,” said the lad. So the lad stopped with him, and lived on the fat of the land, both in meat and drink, and had little or nothing to do; but he never saw a living soul in that man’s house. “No,” said the lad, he’d be sure not to do that. But when the man had been gone three or four days, the lad couldn’t bear it any longer, but went into the first room, and when he got inside he looked round, but he saw nothing but a shelf over the door where a bramble-bush rod lay. Well, indeed! thought the lad; a pretty thing to forbid my seeing this. “No, no; that I haven’t,” said the lad. “I’ll soon see that,” said the man, and went at once into the room where the lad had been. Then the lad begged and prayed so hard that he got off with his life, but the man gave him a good thrashing. And when it was over, they were as good friends as ever. Some time after the man set off again, and said he should be away fourteen days; but before he went he forbade the lad to go into any of the rooms he had not been in before; as for that he had been in, he might go into that, and welcome. Well, it was the same story over again, except that the lad stood out eight days before he went in. In this room, too, he saw nothing but a shelf over the door, and a big stone, and a pitcher of water on it. Well, after all, there’s not much to be afraid of my seeing here, thought the lad. But when the man came back, he asked if he had been into any of the rooms. No, the lad hadn’t done anything of the kind. But the lad begged and prayed for himself again, and so this time too he got off with stripes; though he got as many as his skin would carry. But when he got sound and well again, he led just as easy a life as ever, and he and the man were just as good friends. So a while after the man was to take another journey, and now he said he should be away three weeks, and he forbade the lad anew to go into the third room, for if he went in there he might just make up his mind at once to lose his life. Then after fourteen days the lad couldn’t bear it, but crept into the room, but he saw nothing at all in there but a trap door on the floor; and when he lifted it up and looked down, there stood a great copper cauldron which bubbled up and boiled away down there; but he saw no fire under it. “Well, I should just like to know if it’s hot,” thought the lad, and struck his finger down into the broth, and when he pulled it out again, lo! it was gilded all over. So the lad scraped and scrubbed it, but the gilding wouldn’t go off, so he bound a piece of rag round it; and when the man came back, and asked what was the matter with his finger, the lad said he’d given it such a bad cut. But the man tore off the rag, and then he soon saw what was the matter with the finger. First he wanted to kill the lad outright, but when he wept, and begged, he only gave him such a thrashing that he had to keep his bed three days. After that the man took down a pot from the wall, and rubbed him over with some stuff out of it, and so the lad was as sound and fresh as ever. When he came back, the Horse told him to pull off his clothes and get into the cauldron which stood and boiled in the other room, and bathe himself there. “If I do,” thought the lad, “I shall look an awful fright;” but for all that, he did as he was told. So when he had taken his bath, he became so handsome and sleek, and as red and white as milk and blood, and much stronger than he had been before. “Do you feel any change?” asked the Horse. “Try and lift me, then,” said the Horse. “Yes; there are ever so many coming after us, at least a score,” said the lad. And as soon as the lad did what the Horse said, up rose a great black hill of rock behind him. So the Troll had to be off home to fetch something to mine his way through the rock; and while the Troll did that, the lad rode a good bit further on. But still the Horse begged him to look behind him, and then he saw a troop like a whole army behind him, and they glistened in the sunbeams. So the lad did that; but in spite of all the pains he took, he still spilt one drop on the horse’s flank. So it became a great deep lake; and because of that one drop, the horse found himself far out in it, but still he swam safe to land. But when the Trolls came to the lake, they lay down to drink it dry; and so they swilled and swilled till they burst. “Now we’re rid of them,” said the Horse. But when the coachman begged him to take his wig off, he got the same answer, and he wouldn’t have him either. So, when he had been some time at the palace, it happened one morning, just as the sun rose, that the lad had taken off his wig, and stood and washed himself, and then he was so handsome, it was a joy to look at him. So the Princess saw from her window the lovely gardener’s boy, and thought she had never seen any one so handsome. Then she asked the gardener why he lay out there under the steps. “Let him come up to-night, and lie at the door inside my bedroom, and then they’ll not refuse to sleep with him any more,” said the Princess. “Go gently, and just pull his wig off;” and she went up to him. “And this time she whisked off the wig. 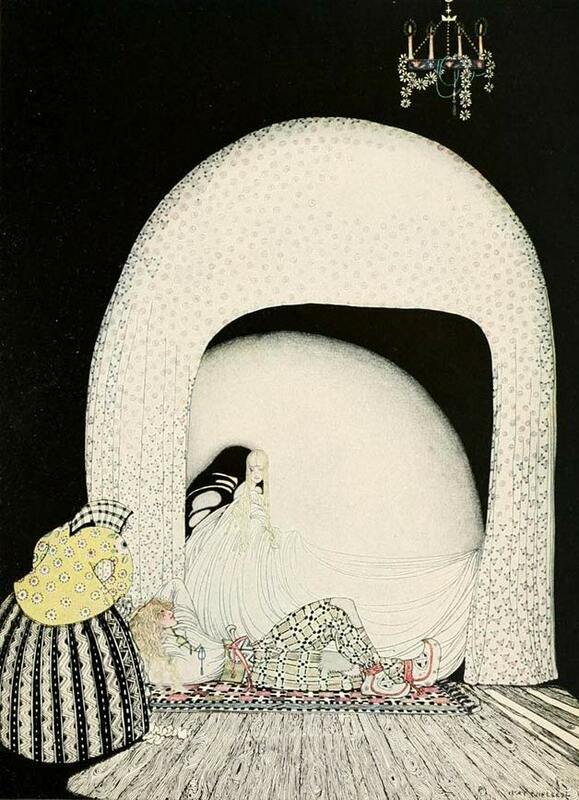 And there lay the lad, so lovely and white and red, just as the Princess had seen him in the morning sun.” Illustration by Kay Nielsen. Published in East of the Sun and West of the Moon by Peter Christen Asbjørnsen and Jørgen Engebretsen Moe. 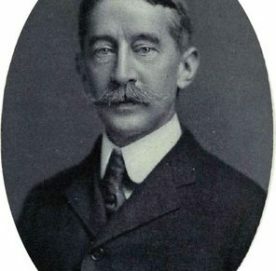 George H. Doran Company. But just as she was going to whisk it off, he caught hold of it with both hands, and said she should never have it. After that he lay down again, and began to snore. Then the Princess gave her maid a wink, and this time she whisked off the wig; and there lay the lad so lovely, and white and red, just as the Princess had seen him in the morning sun. After that the lad slept every night in the Princess’ bedroom. But it wasn’t long before the King came to hear how the gardener’s lad slept every night in the Princess’ bedroom; and he got so wroth he almost took the lad’s life. He didn’t do that, however, but he threw him into the prison tower; and as for his daughter, he shut her up in her own room, whence she never got leave to stir day or night. All that she begged, and all that she prayed, for the lad and herself, was no good. The King was only more wroth than ever. Some time after came a war and uproar in the land, and the King had to take up arms against another king who wished to take the kingdom from him. So when the lad heard that, he begged the gaoler to go to the King and ask for a coat of mail and a sword, and for leave to go to the war. All the rest laughed when the gaoler told his errand, and begged the King to let him have an old worn-out suit, that they might have the fun of seeing such a wretch in battle. So he got that, and an old broken-down hack besides, which went upon three legs, and dragged the fourth after it. But when the lad came up the battle had begun, and the King was in a sad pinch; but no sooner had the lad rushed into the thick of it than the foe was beaten back, and put to flight. The King and his men wondered and wondered who it could be who had come to help them, but none of them got so near him as to be able to talk to him, and as soon as the fight was over he was gone. When they went back, there sat the lad still in the bog, and dug his spurs into his three-legged hack, and they all laughed again. The next day when they went out to battle, they saw the lad sitting there still, so they laughed again, and made game of him; but as soon as ever they had ridden by, the lad ran again to the lime-tree, and all happened as on the first day. Every one wondered what strange champion it could be that had helped them, but no one got so near him as to say a word to him; and no one guessed it could be the lad; that’s easy to understand. So when they went home at night, and saw the lad still sitting there on his hack, they burst out laughing at him again, and one of them shot an arrow at him and hit him in the leg. So he began to shriek and to bewail; ’twas enough to break one’s heart; and so the King threw his pocket-handkerchief to him to bind his wound. When they went out to battle the third day, the lad still sat there. “Gee up! gee up!” he said to his hack. And then they rode on, and laughed at him till they were fit to fall from their horses. When they were gone, he ran again to the lime, and came up to the battle just in the very nick of time. This day he slew the enemy’s king, and then the war was over at once. When the battle was over, the King caught sight of his handkerchief, which the strange warrior had bound round his leg, and so it wasn’t hard to find him out. So they took him with great joy between them to the palace, and the Princess, who saw him from her window, got so glad, no one can believe it. “Here comes my own true love,” she said. So the King had to do what he asked; but when he swung the sword and was to cut his head off, he was so sorry he turned away his face, for he would not see the stroke fall. But as soon as ever he had cut off the head, there stood the loveliest Prince on the spot where the horse had stood.